Happily, The Wick feels like a good fit. Opened in December, the 55-room hotel is set in a former candle-and-soap-manufacturing facility. There’s nothing cookie-cutter about the property, located within walking distance of Hudson’s c.1874 brick Amtrak depot (the third busiest train station in the state) along the east side of the Hudson River. Sections of the building were built in the 1860s, 1920s, and 1950s. Turning it into a comfortable, modern hotel was no easy feat. The designers restored the original hardwood floors and brick details, honoring the building’s industrial past with exposed mechanicals and using blueprints of candle-making equipment as art. They also brought in images by original Hudson River School painters, and work by modern landscape artists currently working in the Hudson Valley. Paintings by Jane Bloodgood-Abrams grace the lobby, and her cloud images are integrated into the glass screens in the bar area. The lobby opens to a bar-restaurant area where signature cocktails and small bites are served at night. A complimentary Continental breakfast is offered daily. (For $7, opt for a full hot breakfast.) For lunch, or those hopping onto an Amtrak train, there are grab-and-go wraps, pastries, and salads. Of course, you’ll want to get out and explore this lively, funky burg — a favorite weekend getaway for New Yorkers looking to escape the bustle of the city. (In fact, many Brooklynites have relocated to Hudson, and launched businesses here.) 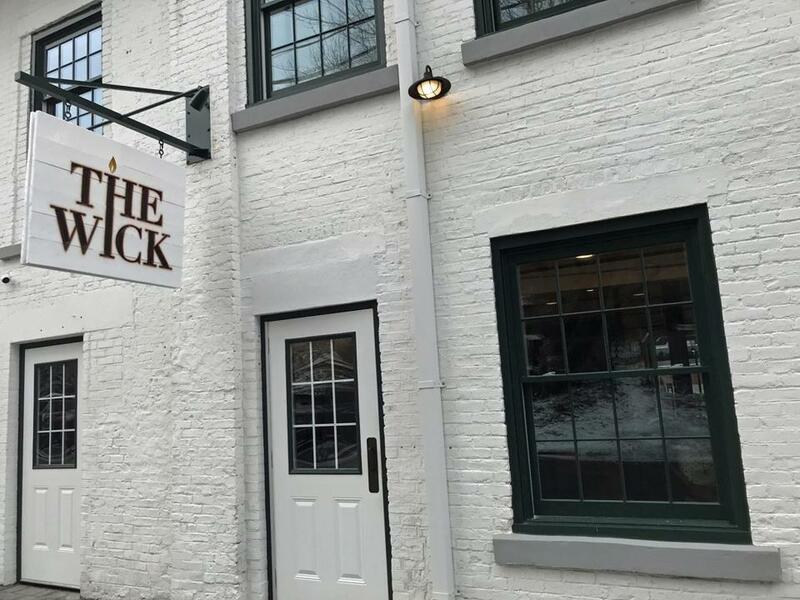 The Wick will shuttle you around in a six-person electric shuttle to Warren Street and environs, chock-a-block with antique shops (skewed toward mid-century modern, natch), boutiques, restaurants, and the Hudson Opera House. In nice weather, this grid-like city is quite walk-able, with the Hudson River rolling through its backyard, and the Catskill Mountains rising in the distance. Chat people up a bit (or pick up a local history guide in Spotty Dog Books & Ale), and you’ll discover intriguing bits about Hudson’s past: that whaling ships (towing their catch) once plied the Hudson River, even though the ocean is 120 miles away; and that this artsy enclave was once famous for piracy, prostitution, and other unsavory activities. For a fun window into Hudson’s past, head over to Hudson Brewing Co. (www.hudsonbrew.com), located in a warehouse row of antique shops; their brews are named after infamous local folk like Shadie Sadie (a female pirate) and Wayward Woman (after a local reform school.) In fact, every beer can tells a story — researched for authenticity — relating to Hudson’s history. For a quick primer on the Hudson River School of artists — plus the region’s most stunning views — visit Olana (www.olana.org), the Persian-style palace on a hillside. Landscape artist Frederic Church once lived in this mansion (now a state historic site), and his paintings are hung throughout. And you’ll surely be tempted by Hudson’s food scene. There’s Grazin’ Diner (www.grazinburger.com), home of organic burgers (the only certified Animal Welfare approved restaurant in the country) and Wm. Farmer and Sons Boarding & Barroom (www.wmfarmerandsons.com), a super-buzzy spot for lunch, dinner, and drinks (where venison carpaccio mingles happily on the menu with ham and biscuits.) Or snag a coveted table at Fish & Game (www.fishandgamehudson.com), a former blacksmith shop. Here, 2016 James Beard award semi-finalist Zak Pelaccio (of NYC’s Fatty Crab and Fatty ’Cue) whips up fire-roasted seasonal delights (say, rabbit cooking on a spit) using two custom-made wood burning fireplaces. Is all of this worth a three-hour or so drive from Boston? Absolutely — especially in summertime, when the hiking trails of the Catskills beckon, and pleasure boats ply the Hudson River. Don’t forget to pack a sketchpad. THE WICK, 41 Cross St., Hudson, N.Y.; 833-THE-WICK; www.thewickhudson.com. 55 rooms, including seven suites. Rates from about $149.